The full fight lineups as known have now been revealed. 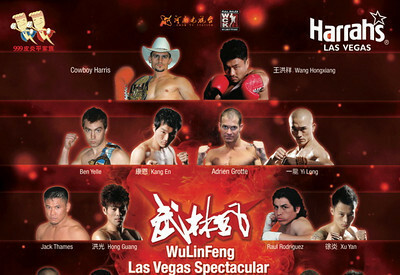 In Sync productions and Dennis Warner will be teaming up to bring the WuLinFeng Las Vegas Spectacular to the United States on November 13th, 2010. The hosting venue will be Harrah’s Casino in Las Vegas, Nevada. Wu Lin Feng as many of you already know reaches more than 30 million viewers via their television product broadcasted from the Henan TV network in China. Live attendance of Wu Lin Feng regularly numbers in the 6,000+ mark. Wu Lin Feng began negotiating with other international markets including the UK and now the USA. In a very real way I could see Wu Lin Feng ultimately filling the void the ailing K-1 brand of Japan is rapidly opening through lackluster matchmaking and not paying fighters. Though time will ultimately tell on that note. Kang En of China will be making an anticipated return to the ring in the United States and was at one time scheduled to rematch Kevin Ross. The fights on the card will consist of 2 full rules Muay Thai bouts with WBC Muay Thai overseeing the matches while the remainder of the fights will be conducted under modified rules with out elbow strikes. Las Vegas favorite, Jack Thames will stand up to Guang Hong, the star of the Art of War championship and national champion of China. Thames is coming off of two wins by KO and TKO against Mike Ryan of Los Angeles, and Eric Utsch of Penn. respectively. Thames is also set for a re-match with Craig Buchanan for a WBC MuayThai National middleweight belt after a close fight result in April of this year. Heath “Cowboy” Harris is set to fight the leader of the Chinese team Wang Hongxiang, who demonstrated a spectacular win over Joe Schilling last year in Las Vegas. Harris is best-known for his knockouts, 28 knockouts out of 29 wins. WBC Muaythai International Super Lightweight Bout 5rds. WBC Muaythai Super Featherweight Bout 5rds. WuLinFeng Light Heavyweight Bout 3rds. WuLinFeng Super Welterweight Bout 3rds. WuLinFeng Women’s Featherweight Bout 3rds. Fights start at 7 p.m. at Harrah’s Las Vegas Ballroom. Tickets are priced at $75, $100 and $150. For fight info, please dial 877-446-7962. For tickets please call 866-998-3427 or go to www.vegas.com. Notably, no WBC Muay Thai straps are being staked and it appears true to Patrick Kusic’s word WBC Muay Thai will convene in Cancun, Mexico’s convention to determine rankings, committees and overall structure on how each country decides its rankings. To that end I have made a request to see these rankings and have asked not only for a clearer picture of the USA standings but the world’s, broken down nation by nation. Stay tuned and I’ll let you know when I know.